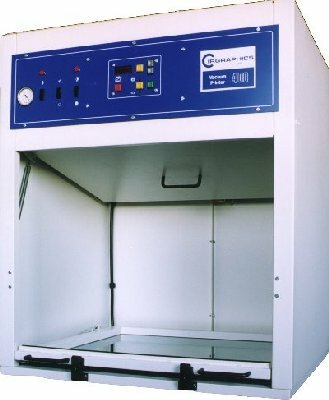 The Model T400 is a low cost, single sided vacuum frame exposure unit, which is enclosed within its own cabinet. Exposures are controlled by a light integrator system, which accurately measures the amount of UV energy reaching the vacuum frame ensuring repeatable exposures throughout the life of the lamp and in spite of any voltage fluctuations. The UV output of the specially designed lamp supplied as standard has a major peak of energy at 365nm which closely matches the majority of dry film and liquid resists currently available. A 420nm lamp is also available for specialty materials and diazo film. As standard, the Model T400 has a glass frame which includes a specially designed, hard wearing, moulded vacuum seal. As an option, a patterned polyester sheet can be provided in place of the glass in the vacuum frame. The Model T400 incorporates a semiautomatic exposure sequence. Once the work has been placed in the frame and the frame is closed the vacuum button is pressed. This starts the vacuum pump and initiates an operator set delay. When the light seal door is closed the exposure will start once the delay has finished. At the end of exposure andwhen the door opened, the vacuum is automatically released, allowing easy access to the work. A yellow safety lamp is incorporated and can be switched on or off. An Eight memory computer controls all the functions of the exposure unit, such as exposure values, light levels and delays etc.